Editor’s note: This column first ran on May 12, 1985, when Bob Ryan examined the first 12 playoff series between the Celtics and 76ers. Since then, there have been two others, in 1985 and 2002, both won by the Celtics. Carlos Clark and Sedale Threatt may not know it, but just by being here today they are part of history. Like Harvard vs. Yale, Hedda vs. Louella, McDonald’s vs. Burger King (sorry, Wendy’s), “Dallas” vs. “Dynasty” and Liz vs. Natalie, the Celtics vs. the 76ers is not just a competition, not merely a matter of Life and Death. It is More Than That. In the ‘60s, their confrontations practically defined pro basketball. The images are fixed in memory: Chamberlain vs. Russell . . . Heinsohn’s running hooks . . . Greer’s pull-up jumpers . . . Luke Jackson’s scowls . . . Sam Jones’ bankers . . . Chet Walker’s up-fakes. It was great basketball and it was even greater theater. Here in the ‘80s no essentials have changed. The fan passions remain, inflamed on one end of I-95 by septuagenarian PA announcer Dave Zinkoff (”Twoooooooo minutes left to go in this qwah-tah!”) and stoked at the other end by Johnny Most, the only man in this solar system who thinks Bobby Jones (Mr. FCA himself) should be incarcerated. The only two things you really need know about how the competing players feel are these: (1) In 1983 they had a brawl during an exhibition game. (2) It wasn’t the first time it’s happened. So what was true when everybody watched “I Love Lucy” is still true in the Bill Cosby era. In the world of professional basketball, there is only one rivalry, and this is it. The teams will be meeting in the playoffs for the 15th time since 1958. Take a look at some of their past matchups, and how they may affect this series. Frankie Laine was at Blinstrub’s . . . Clark Gable and Doris Day were starring in “Teacher’s Pet” at the Metropolitan . . . Jeff Chandler and Lana Turner were headlining “The Lady Take a Flyer” at RKO Keith Memorial . . . And the first Celtics-Warriors playoff game ever was held on March 19, 1958. Boston started Tom Heinsohn and Lou Tsioropolous at forward, Bill Russell at center, and Bob Cousy and Bill Sharman at guard. The Warriors, coached by George Senesky, countered with Paul Arizin and Woody Sauldsberry at forward,Neil Johnston at center, and Tom Gola and Jack Goerge at guard. Referee Arnie Heft was delayed by a snowstorm, but Woburn’s Jim Gaffney subbed for him until the second quarter . . . The Celtics, led by Cousy’s 29, won it, 107-98. The first Russell-Chamberlain playoff duel . . . Wilt goes for 42 points and 29 rebounds in the opener (Russell gets 19 and 30), but Celtics, naturally, prevail, 111-102 . . . A frustrated Guy Rodgers choves The Cooz - Mercy! - over the scorer’s table late in Game 1 . . . Heinsohn and Wilt engage in fisticuffs during Game 2 . . . Chamberlain erupts for 50 points and 35 rebounds in 120-102 Warriors’ triumph in Game 4 . . . Heinsohn’s tap-in of missed Sharman shot at buzzer wins the series in six games. Game 1 headline blares, “C’s Win - Hold Wilt to 33” . . . Jim Loscutoff calls Wilt a “prima donna” after Game 2 . . . Heinsohn ejected for hitting Ted Luckenbill in Game 4 after almost being flattened by Tom Meschery . . . Sam Jones’ 15-foot banker with two seconds remaining wins seventh game, 109-107. Chamberlain credited with 39 rebounds in Game 2, but Globe count reveals 27 instead . . . Red Auerbach is hit by a fan en route to the locker room in same game . . . Greer’s 35-foot inbounds jumper ties Game 4 at buzzer, and 76ers bag 134-131 OT triumph. “It couldn’t have been done in one second,” snorts Auerbach, who secretly wishes he could hire the timer . . . Game 7 lives forever because that’s when HAVLICEK STOLE THE BALL to preserve a 110-109 victory. Game 1 held in dingy Philadelphia Arena, but Celtics yawn and run with 115-96 victory . . . Chamberlain takes one shot in second quarter of Game 5 . . . Auerbach beats Philly for final time as coach. Wally Jones and Larry Siegfried square off in Game 1, which is held at the Palestra . . . Game 2 threatened by AFTRA strike . 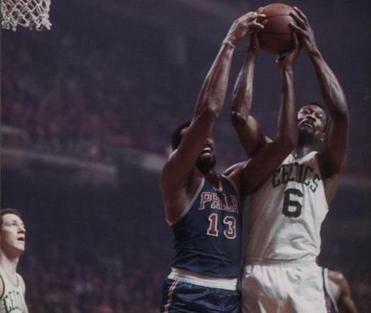 . . Philly destroys Celtics in Game 5 as Wilt goes for 29 points, 36 rebounds and 13 assists, and Wally, by golly, drops in 8 of 9 third-quarter jumpers in 140-116 Sixers’ rout. Greer shoots 3 for 23 and misses 17 straight shots as Celtics win Game 1, 114-100 . . . Referee Jack Madden throws out Sam Jones and team publicist Howie McHugh, but Celtics survive both losses to win Game 2, 134-103 . . . An easy series. Jo Jo White’s 20-footer from the left corner at the buzzer pulls out Game 1 as Dave Cowens does the twist in celebration . . . Cowens comes up with playoff career-high 37 points and 21 rebounds as Celtics win Game 4 to tie series at 2-2 . . . Celtics extend series to seventh game behind White (40) and Havlicek (25, and serious defense on Dr. J.) as Celtics win Game 6, 113-108 . . . Philly gets third-quarter spurt from Lloyd Free to win The Game Nobody Seems to Want, 83-77, in Game 7. From Boston standpoint, The Greatest Of Them All . . . Two Andrew Toney free throws at 0:02 win Game 1 in Boston . . . Bird’s 34 evens series the following night . . . Robert Parish shoots 1-14 in Game 3 . . . Bobby Jones’ steal saves Game 4 . . . Ultra Comeback begins in Game 5 as Celtics win, 111-109, after trailing by six without the ball with 1:43 left . . . Cedric Maxwell battles Sixers fan in Game 6 and Kevin McHale makes key block on Toney as Celtics come from 15 down in third quarter to break 11-game Spectrum losing streak . . . Game 7: Celts shoot 36 percent from floor and 63 percent from line, but prevail as Darell Garretson and Jake O’Donnell put whistles in pockets and Sixers score one point in final 10 possessions, blowing seven- point lead . . . YES, THEY DID IT! blares The Globe on Page 1 . . . Post- game Causeway street celebration an all-timer.